On Saturday I went to a museum in San Antonio to see some work by one of my influences Edward Gorey. I really enjoyed seeing the originals and it made me want to render something in pen and ink. I use to use ink all the time and I kind of miss it, but I noticed my eyes get tired quicker now. sigh. 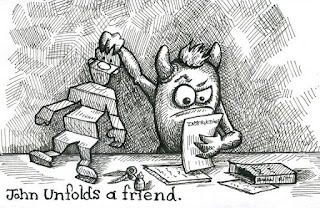 So, what do imaginary friends do if they don't have a human to hang out with? They make one. You can order a kit on the imaginary internet... I'd imagine.